The Windows 8 developer preview release that was offered publicly by Microsoft a few days ago caused quite the stir. There were users who loved the new Metro UI interface and other features of the operating system like the Ribbon of Windows Explorer. Other users criticized the new user interface as to tablet and touch centric. I for one posted my thoughts in a two posts about Windows 8 at the same day the OS was released. It needs to be mentioned that the release is an early preview version, it is not even a beta. This makes it likely that Microsoft will use feedback from users to fine tune the experience (Microsoft, if you are reading, please give me an option to disable Metro UI completely). The first tweak that came out was a Registry hack and soon thereafter a program to disable Metro UI partially on the system. The hack would add the classic start menu known from Windows 7 to the desktop part of the operating system. It was still possible to switch to the Metro UI interface, but the tiles there were not functional anymore. Today one of Ghacks's readers recommended a program called Metro Controller which as he puts it is the answer for all users who do not want to work with the Metro UI. And to put icing on the cake, it is developed by Ghacks regular Happy Bulldozer. The program offers the following functionality: Windows 8 users can either disable the majority of new features including Ribbon Explorer, the new Lock Screen or the Metro Start Screen, or they can only disable all Metro features. All that needs to be done on the user part is to select one of the options. The program will work its magic and display a prompt to restart the computer. 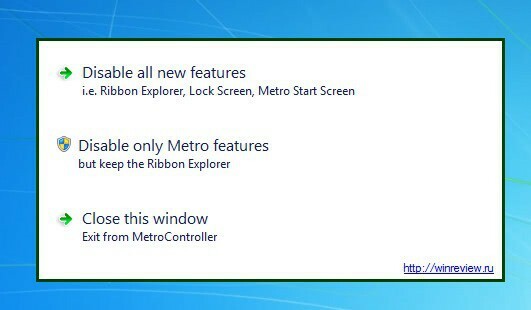 I personally do not really mind Ribbon Explorer, which is why I selected to disable all Metro features. Metro was completely gone from the system after the first restart. The start menu button displayed the standard start menu, and pressing the Windows key did not lead to Metro UI Start anymore. The program can be used to rollback the changes. When you start it again after making changes, you get a slightly different menu that offers to enable the feature that you disabled again. A word of warning. The program makes changes to the system's Registry and dll files. It is probably not a big issue for a developer preview, as most users will have it installed in a virtual machine, as dual boot or on a test system. You can download Metro Controller from the developer website over at Win Aero. So its going to be a plain windows 7 finally when we disable the METRO .. interesting but i think windows 8 build specially to target iPad 2..
Martin, I think the new copy dialog and task manager are built into metro UI. When I disable metro with this tool or the registry hack, all the new cosmetic features are disabled. I know this is a preview but I don’t think Microsoft should have released this preview at all. Why can’t Microsoft implement a system where middle click or key combination brings the old start menu rather than this metro UI which looks cluttered and gives the impression that it was designed by a toddler. And don’t get me started about the Ribbon UI. Defeating the new major features of Windows 8 misses the whole point. This is a test release and it should be tested as designed and intended. system is not what anyone should be doing. Robert, I don’t know anyone using this preview as their main system and you should be more elaborate about the point missed. The “so called” major new features are unsuitable for desktop use (at least for me and several others, including the author of the article) and as such many people are disabling the “major new feature” in order to test other new features. I don’t know about you but I have never tested any preview or beta OS as “designed and intended” simply because as a potential customer or user, I’ll be using the final version as I want and not as the OS vendor “intended”. I believe everyone is testing it as they want and not as Microsoft “intended” and any feedback to Microsoft about “major new features” that disrupts productivity is necessary. Can you please enlighten us on how Microsoft wants the general public to test this preview? Microsoft is interested in professional feedback on the new features. Microsoft does not want the general public to test this release. This release is clearly not intended for the general public. Personally, I do not find the Metro UI suitable for desktops. Microsoft will need to make major changes for it to be so. Feedback on this release should lead to such changes. That is is Microsoft listens to users using the features. Should major changes not be made I’ll be skipping Windows 8. At least for any desktop. A tablet with good battery life, yes. LOL. Microsoft is interested in “professional feedback” and ” does not want the general public to test this release” so they released it to the general public. Hmmmnn, I wonder why that sounds strange. It seems that they are not only interested in “professional feedback” or they would have released this on MSDN only. It’s called a “Windows 8 Developer Preview” for a reason. it is intended for the general public. The “test” of Windows 8 Dev Preview has proven beyond doubt that the Metro UI is a complete failure, and the Ribbon is utter crap. *PEOPLE DO NOT WANT THESE CHANGES* on desktop and laptop PCs. Period. On a tablet, they make sense. As the default UI on a computer being used for productive purposes, they are utterly idiotic.